Welcome to WIZ - BEST OF THE BEST LIFE Environment Project 2014! After the selection as one of the 25 Best LIFE Environment projects out of the 102 that finished and were evaluated in 2014, on April 17th 2015, the WIZ project has been selected as one of the 8 BEST OF THE BEST Life Environment Projects 2014. A great result for all the partnership! ACQUE Spa (Ing. Roberto Cecchini) and Ingegnerie Toscane (Ing. Simone Lippi) on behalf of the partnership, participated in the awarded ceremony held in Bruxelles on June 4th 2015. 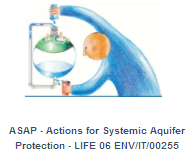 In three years of activity (2010-2013), with an investment of about 1,900,000 € (of which over 940,000 € financed under the EC LIFE+ Programme) the partners of the LIFE 09 ENV/IT/000056 - WIZ - WaterIZe spatial planning: encompass future drinkwater management conditions to adapt to climate change project have shown that it is possible to take into account the conditions and future availability of water when making choices of spatial planning and urban development, and for the citizens, lifestyle choices. The platforms WIZ4Planner and WIZ4All are available on-line in two versions: Italy and Spain. WIZ Layman's Report is available for download! The Municipality of Baiona publishes WIZ4ALL on its official web-site! Citizens can easily access and consult all available information! The Municipality of Vilagarcia de Arousa participates in WIZ4ALL! Citizens can easily access and consult all available information also with mobile application! This page was last modified on 15 May 2017, at 14:51. This page has been accessed 186,059 times.